Founder’s Day was established to honour the people who brought this University into being and to give recognition to those who fostered the creative moments in its history. It is right that we should revive it this year, the 100th anniversary of the birth of Max Aitken, Lord Beaverbrook. What he gave of his substance we can see in many parts of the campus. What he gave of himself was even more significant, for his imagination and energy were vital in bringing the quickening of intellectual life that marked our transition from a small college to a true university. Max Aitken was born in Newcastle, New Brunswick. It was too small for him. So he went to Halifax in Nova Scotia. It was too small for him. He left for Montreal, the commercial capital of Canada. It was too small for him. He came to London. It is too small for him. He will go to hell. It won’t be big enough. 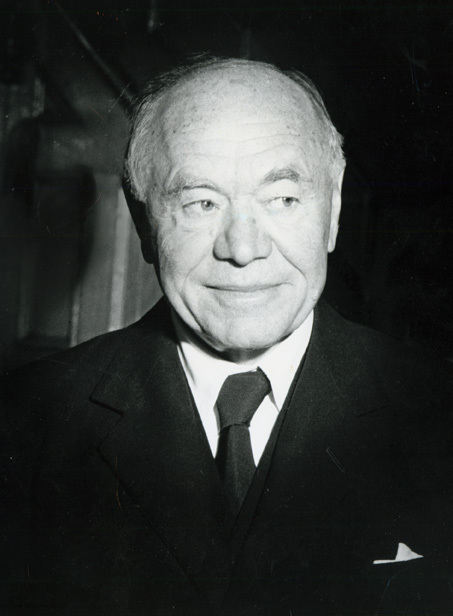 For more than half a century, Lord Beaverbrook lived and moved among the mighty in world affairs. Andrew Bonar Law, the only Canadian-born prime minister of the United Kingdom, and R.B. Bennett, the only New Brunswick-born prime minister of Canada, were friends of his youth and young manhood. His help was all-important to both of them in their careers. When he first went to England, Lloyd George and Winston Churchill were still the Young Turks’ of the Liberal Part. They became his friends. Beaverbrook, who was then Sir Max Aitken, was active in arranging the partnership, in 1916, between Bonar Law and Lloyd George, who led Britain through the last, critical, years of the First World War. Lord Beaverbrook lived for politics, craved drama and excitement, and was insatiably curious about human behaviour. At this time of year, when he regularly addressed the students on this campus, he returned again and again to the importance of politics and politicians. Young men and women should dedicate themselves to the arts of persuading people to work together for the public good. He had a lifelong fascination with the spoken and printed word. Kipling was a friend, for several years, and he employed Arnold Bennett as a critic, but the writers who lingered were those he had read as a boy, Sir Walter Scott, Robert Louis Stevenson, Trollope, Norman Macleod, and John Galt, whose Annals of the Parish owned a special place in his heart. The literature that he quoted most frequently was The Bible. He held public office only for two brief periods, both during war-time. In World War I, his work was in the field of information and propaganda. In World War II, his most memorable achievement came as Minister of Aircraft Production during the Battle of Britain. For Beaverbrook, as for Britain, 1940 was his finest hour. But his contribution late in the war may have been even more important, for he continued to be at the very centre of political affairs in the following years. Most of those who have written about Lord Beaverbrook are from the Old Country and they tend to dismiss his New Brunswick background as unimportant. Beaverbrook himself didn’t and he was right. The society of the Maritimes throws up, or should I saw throws out, from time to time, aggressive, buccaneering personalities, and although we don’t study it, we Maritimers also have a distinctive intellectual history. In particular, we developed very definite ideas about the nature of the British empire. In Beaverbrook’s boyhood, the most influential propagandist of empire was Sir George Parkin, a UNB graduate who served for many years as headmaster of Fredericton Collegiate School. Winston Churchill heard Parkin speak at Harrow and was inspired by him. So were many others. Parkin packed his one spare suit in his suitcase and headed off to South Africa, New Zealand, and Australia to preach the message of a partnership of British countries around the world. Ah, yes, he was a proper villain, but I liked him. He was a very jovial man, full of fun. He made lots and lots of jokes. Yes, he was a fine fellow. Drank a lot. In business, as in politics, Beaverbrook’s ideas were formed before he left the Maritimes. The young Max Aitken sent agents through the countryside selling stocks and bonds. He was the first Canadian to do so. He became a company promoter and formed the companies to provide electric utilities and electric railways to cities in Cuba and other parts of the West Indies. Speed with accuracy, foresight, and judgement were the keys. He outwitted the Montreal tycoons and was a millionaire when he moved to England and entered on a political career in 1910. He was thirty-one years of age. Seven years later, he was made a peer, taking his title from the little place near Newcastle. He and Rudyard Kipling though that the name had a fine sound. It would also emphasize his Canadian origins. To Beaverbrook, wasting time was unpardonable. He took enthusiastically to the telephone and the airplane. He didn’t even sit at a desk. Instead he stood at a lectern, barking orders and writing brief notes to dozens of people every day. Everybody who had contact with Beaverbrook received them. It was part of his techniques for establishing personal relationships. Sir Lewis Namier said that the basic requirement for entry into British society was to be amusing. Beaverbrook set out to be more amusing and to entertain more than anybody else. He also set out to cultivate young people, to spot their talent and to employ their vitality and enthusiasm. Because money meant too much to him, he assumed that most other people like it, and he made it worthwhile for talented people to associate with him. But he also attracted and held the loyalty of many who were not tempted by his money. Prime Minister Stanley Baldwin accused him of “seeking power without responsibility, the prerogative of the harlot in all ages.”** Lord Beaverbrook was too free a spirit to play the game of British politics according to the rule. He called himself a Conservative but continually criticized the party, its leaders, and its policies. There was one incident in his early political career of which he was particularly proud. That was the part he played in arranging the Irish Treaty of 1921. If that agreement had been used wisely by the next generation of statesmen, it could have led to peace and stability in Ireland. …the Scottish population of Ulster has, in the course of nearly three hundred years of settlement, intermarried with the old Irish stock. My ancestry might therefore be put down as four-fifths Scottish and one-fifth Irish. The racial admixture is a clue to my character. There is all of the ‘dour’ duty side of the Covenanters … and the industry, the exactness of the Lowland Scot. But there is also a Celtic strain which gets up and dances. It was to his mother that he attributed his high spirits. Incidentally, it was also from her that he inherited asthma, which caused his high spirits to be very depressed for long periods. His strong sense of identity with the Irish no doubt owed more to environment that to inheritance. The Miramichi community was an amalgam of Scots and Irish and it was bound to be obvious to the young Max Aitken that the Irish had more fun. Apart from his career as statesman, politician, and financier, he had other important vocations – as publisher, journalist, and philanthropist. In all of them he showed dynamism, inventiveness, and imagination. To these, I should add his career as a writer of books, for two or three of his books are very good and, contrary to popular rumour, he wrote most of his later books himself—through he had first-rate research assistants. It was said that the only thing that he couldn’t do in his newspapers was to draw the cartoons. In writing, he developed his own style. His model was Rudyard Kipling. In London or in Fredericton, he used the telephone to dictate editorials or items for anonymous columns, or diaries, that were a feature of his newspapers. He even dictated letters to the editors; and reporters had sometimes to dash out into the pubs of Fleet Street to find likely-looking persons to sign them. His newspapers were among the most lively in Britain and, for years, his main aim in life was to make sure that they were the most widely read—not so much for the profits, as for the power and influence that this would bring him, and for the opportunity to carry the message of Empire free-trade. Standing, staring at the ruins of Stornoway House that morning, I knew none of this. As he poled in the rubble with his cane, he expressed a hope that some of his personal papers that had been lost might yet be found. It was part of a journey into the past that became a passion in his later years. Malcolm Muggeridge saw a morbid quality in this. He accused Lord Beaverbrook of having an obsession to place himself at the centre of the history of the twentieth century. It was another way of erecting monuments to himself, that he might not be forgotten. Muggeridge, of course, has the answer to all questions—and he is partly right. But Beaverbrook also went back to the past because he had a genuine interest in history and I think that he went back looking for something that he felt he had mislaid. He had come too far, too quickly and was going back over the ground. He was not the sort of man who believes that you can wipe out the past simply by forgetting it. It is easy to pass off a Presbyterian background with the old joke that a Presbyterian is a self-made man who worships his creator. A Presbyterian may be a man who grows up feeling that he is not among the elect. At least one of his biographers takes seriously Lord Beaverbrook’s claim that all of his life he felt himself to be very unworthy. Although he often wore the clown’s mask, Beaverbrook, at heart, was a deeply thoughtful man, always concerned about the well being of mankind. The world is divided between those who remembered the boot and those who responded to the charm. He made enormous demands both on his friends and on his employees. Some individuals accepted those demands and, while recognizing his shortcomings, never doubted his basic goodness. Others saw him as the devil incarnate, or as a mischievous and irreverent trickster, placed on earth to test the patience of grace and responsible leaders of men. Scholars will line up for and against him for at least another generation. We have only just, finally, got a fair, objective assessment of the life of Cecil Rhodes, three-quarters of a century after his death. Beaverbrook was very like Rhodes in demanding and receiving loyalty and in creating suspicion and antipathy. We can see this is two recent examples from the world of scholarship. The biographer who finds the key to Lord Beaverbrook’s personality will find it, I suspect, in the complicated emotional relationship between him and his father. He carried his father’s name, William; Maxwell, which became shortened to Max, was his middle name. The Reverend William Cuthbert Aitken was a Scot from a village in Linlithgow. I was under the impression, from hearing Lord Beaverbrook talk about him, that he walked to Edinburgh University every Monday morning carrying his bag of oatmeal to feed himself for the week. He may have, but if he did, it was because the family was careful and lived frugally. William Aitken had the best education that Scotland could provide; a good school, followed by four years in Arts at Edinburgh, and then four years of Divinity. When Beaverbrook’s Irish crony, Lord Castlerosse, came out to Newcastle he was astonished to discover that the Beaver’s childhood had been spent in a comfortable house, that his father had a library and the leisure time to enjoy reading English novels, and that at times the family employed both a hired maid and a hired man. At school he was incurably idle, out of school he showed a talent for making money and for making himself acquainted with interesting people at all levels of society. He was capable of intense concentration but would never stick at anything for very long. He failed his examination for entrance to Dalhousie University. He refused to enter a bank. He became a pupil of L.J. Tweedie and R.B. Bennett in their law office in Chatham and began selling insurance and acting as a local correspondent for the Montreal Star. He entered law school in Saint John, then dropped out and spent three years in activities which covered ground from Calgary to Cape Breton. Then, on his twenty-first birthday, according to his version of his life story, he had a dramatic conversion, but it was a conversion to the world and not from it – a conversion to hard work and money making. It was at that point that his climb to fame began. There had been earlier thoughts of rebellion against the dour Presbyterian aspects of family life, with its emphasis on learning self-discipline and theology. ‘May the desert rejoice and blossom as the rose, and the barren places become fruitful. And now O Lord what wait we for?’ How I longed to cry out ‘My breakfast,’ but I had the good sense not to give way to this impulse. The fifth commandment, with its implicit threat that lack of respect for one’s parents may lead to a short life, could be very real to an imaginative boy reared on the Old Testament. I remember, as a five-year-old, being required to memorize the Ten Commandments, and being more impressed by that one than by any other. The scripture on coveting my neighbour’s ox did not upset me. Lord Beaverbrook had great respect for his father’s learning. Because of his father, he could appreciate the scholarly life; and, like Cecil Rhodes, also the son of a clergyman, universities had a great attraction for him. As young men, both had kept their love of universities fresh by staying clear, or nearly clear, of them. By providing summer tours of Europe for teachers, he brought to New Brunswick classrooms a taste of the world that he had come to know. His undergraduate scholarships provided UNB with a core of able students and attracted the interest of all parts of the province. A few years later, he gave buildings that restored the benefits of residence life to the campus and made possible a varied athletic programme. 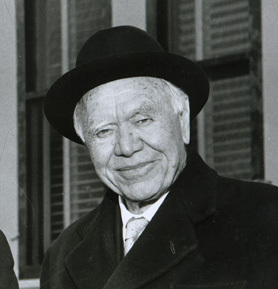 Just after World War II, Lord Beaverbrook agreed to accept the office of chancellor. From the on, he returned to UNB regularly, like a wealth and exciting grandmother visiting a household of children. When he appeared, all of New Brunswick took on a new vitality, as newspapermen, industrialists, preachers, poets, scholars, and politicians came from far and near to pay court and to meet the friends and companions that he brought with him. Perhaps I should add a word on the appointment of the new president in 1953. When the documents are opened up, I suspect that the verdict will be that Lord Beaverbrook was very clever, and probably wise, but that not even he could avoid the pitfalls of UNB politics. Among the people who approached Lord Beaverbrook with suggestions back in 1946 was Dr. Bailey, then a freshman dean of arts. He believed that what UNB needed most was a library, to replace the existing one which was supposed to contain about 15,000 volumes, making it about the smallest university library in Canada. Three and one-half years later, it had 50,000, with the books carefully chosen. It was the new library that enabled UNB to develop honours and masters programmes, and to take the giant step of promoting original research. Orders for books were prepared under Dr. Bailey’s direction. Lists went to Lord Beaverbrook in London. He asked questions and sent the lists to British scholars for their comments. Dr. Bailey had then to justify his selections. Lord Beaverbrook bought all of the books requested, except for a handful on American subjects. He also sent along first editions of Kipling and other authors he admired, and a number of original documents that took his fancy. He built a handsome wing on the Library to provide space for researchers. In it he proposed to place collections of papers of famous men. He named it the Bonar Law-Bennett Library and opened it with much publicity. Over the door he placed an ambiguous motto in stone: Ne derelinquas me domine – which, in free translation, reads “Do not neglect us O Lord.” It is here, like the chiming of “The Jones Boys” at the Lady Beaverbrook Building, to remind us of His Lordship’s sense of fun. In these same years, he set up the Old Manse Library in Newcastle in memory of his father. He employed Louise Manny to run it and continued to encourage her in her collecting of Miramichi folk songs. He was really the patron of the revival of New Brunswick folklore. A prominent professor a UNB at that time was Frank Toole. Toole was an Irishman from London, a cultivated man, a musician as well as professor of chemistry. He was a radical in politics. I remember Lord Beaverbrook’s speech to the UNB Club in Toronto in the fall of 1949 when the McCarthy witchhunt was sweeping North America. Lord Beaverbrook often made an important point by telling a joke at his expense. He wasn’t a very big man, but he had an enormous head, his mouth was very wide—one of his schoolboy chums said that if the Lord had wanted to make his mouth any wider, he would have had to remove his ears—and his voice was deep and carefully modulated. They say that Toole’s a Communist. Drunk in the streets, they’re to take him home. They’ll be coming after me. Frank Toole built up our fine research centre in chemistry in which scholars from all over the world have studied. Lord Beaverbrook attracted attention to UNB both to this campus and to the Law School in Saint John. He encouraged the provincial government to spend more money. He prompted local supporters to take initiatives. He persuaded his own friends to take up the cause. In short, he was the catalyst in revitalizing the university and providing the heart from which we were to grow when governments reawakened to the needs of higher education at the end of the fifties. He was always interested in direct contact with, and direct assistance to, young people. New scholarships brought undergraduates from Britain and graduate scholarships encouraged the development of chemistry, forestry and law. I was one of the graduates of UNB who attended the University of London on Lord Beaverbrook Overseas Scholarships during his lifetime. We were privileged people, even in that great University, with His Lordship’s personal support and with Sir Tom Blackburn and a number of his other friends ever ready to look out of our interests. His philanthropy continued to the end—a park on the Miramichi, skating rinks, the art gallery, visiting lecturers, support of Presbyterian churches, grants to a children’s hospital in London, and finally, The Playhouse. He was not an expert on everything and occasionally was cheated in making purchases; but by and large, he got very good value for his money, and made life in New Brunswick, especially in Fredericton, culturally much richer and much more exciting. His eye for talent continued to be sharp. In 1958, he brought John Kennedy to UNB to receive an honorary degree, and spotted the charisma in Louis Robichaud before the 1960 election made him premier of New Brunswick. In 1957, I was back in London briefly on the way out to West Africa. It was raining, and, as I walked towards the entrance to Senate House on a dark evening, I spotted a tiny figure, walking back and forth, his shoulders huddled up in his coat collar. I suddenly realized it was His Lordship, who had come out of a meeting and was waiting for his limousine. I stepped up and spoke to him. He was seventy-eight years old and suffering an attack of asthma. For a moment he seemed lost. Then he straightened up, thrust out his head and started to ask questions. I hadn’t seen him for two years, yet he picked up the conversation at exactly where we left off when we last met. And it was my affairs that we talked about. It was flattering, of course; but he could do the same with dozens of people, creating the illusion that he was seeing more of, and was “more intimate with oneself than with any other person in one’s community.” This talent created the impression that the person with whom he was dealing had a special place in his affections. When the spirit moved him, he could improve the self-esteem and raise the sense of worth of any man or woman, from the lowest to the highest in the land. What would we not give to see him once more at the head of the table, with that glint in his eye and that impish grin on his face, ready to catch us off guard with an irreverent remark, or to hear him reminisce, drawing on all the wisdom and all the knowledge of that rich mind? **Peter Howard says that is was Kipling who gave this phrase to Baldwin, after Kipling had turned against Beaverbrook because of his stand of the Irish question. Every person who met Lord Beaverbrook came away with a story to tell. I have talked to many of them - a few from his youth, some from mid-career, and others from his old age. He wrote books - at one time or another, I have read most of them. Many books and articles were written about him - I have read some of them, though usually for pleasure rather than as a scholarly exercise, for I am not a student of his life and times, nor have I ever attempted to become an expert in all the nuances of late nineteenth century individualism - aptly described recently as "the transubstantiation of egotism" - of which Lord Beaverbrook was an exponent and exemplar. I owe a particular debt to Dr. A.G. Bailey who has allowed me to read, and to make use of, an unpublished and scholarly memoir on his long association with Lord Beaverbrook. I also wish to acknowledge my obligation to the late Professor Kenneth Windsor for expanding my understanding of Canadian Presbyterianism in the late nineteenth century. He had deeply immersed himself in the subject as part of the background for a projected biography of the Rev. G.M. Grant, the great principal of Queen's University. Professor Windsor was killed in an automobile accident in Poland in June, 1979. 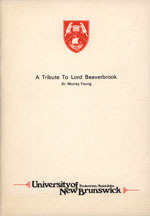 Lord Beaverbrook, My Early Life (Brunswick Press, Fredericton, 1965), pp. 18, 24, 112. Lord Beaverbrook, The Decline and Fall of Lloyd George (Collins, London, 1963), p. 96. Peter Howard, Beaverbrook: A Study of Max the Unknown (Hutchinson, London and Brunswick Press, Canada, 1964), pp. 21, 22, 66, 156. Noel McLachlan, 'A Monster but Irresistably Fascinating', The Age, Melbourne, Australia, December 2, 1972, p. 16. A.J.P. Taylor, Beaverbrook (Hamish Hamilton, London, 1972), pp. 1, 140, 632, 660, 666. Dr. Murray Young is a New Brunswick historian who devoted much of his research and writing to the history of his native province. After graduating from the Provincial Normal School in 1940, he taught for a time in rural schools and then served for four years as a radar mechanic in the Royal Canadian Air Force. He received his BA from UNB in 1949, with honours in English and History. 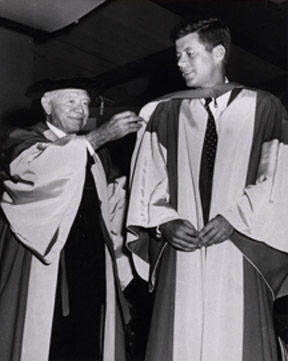 After studies at the University of Toronto, he read for a PhD in Imperial History at the University of London under the direction of Professor Gerald S. Graham, receiving his degree in 1955. Dr. Young has earned a number of academic awards and honours, including an Alexander MacKenzie Fellowship at the University of Toronto, a Lord Beaverbrook Overseas Scholarship for study at the University of London, and a postdoctoral Ford Foundation Foreign Areas Fellowship to undertake African studies at Boston University. He has also received fellowships and grants for research from the Canada Council. A faculty member at the University of New Brunswick from 1959 to 1987, Dr. Young served as chairman of the history department, as a member of the university's Board of Governors and its executive committee, and also served on several committees of the Board of Governors and academic Senate. He was a faculty member of the World University Service of Canada Seminar in West Africa in 1957 and has also been a council member of the Canadian Historical Association, a corresponding member of the Humanities Council of Canada, and chairman of the Atlantic Association of Historians. 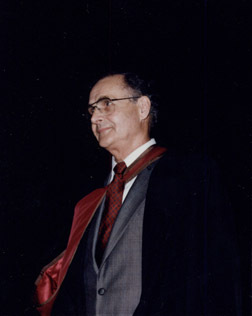 At UNB's 1988 Fall Convocation, he was awarded the designation of Professor Emeritus. Dr. Young is the author of The Colonial Office in the Early Nineteenth Century, (London, Longmans, 1961), as well as author of a number of articles and reviews in professional journals, encyclopedias, and in the Dictionary of Canadian Biography. Source: A Tribute to Lord Beaverbrook. p. 15.